Since Chicago food truck vendors were given the right to cook on board just a few years ago, the city's rolling cuisine scene has exploded. Tracking apps like Chicago Truck Finder and Roaming Hunger (and Twitter, of course) make it easier to discover and keep tabs on trucks, but it's not always clear which ones are worth your time and dough. 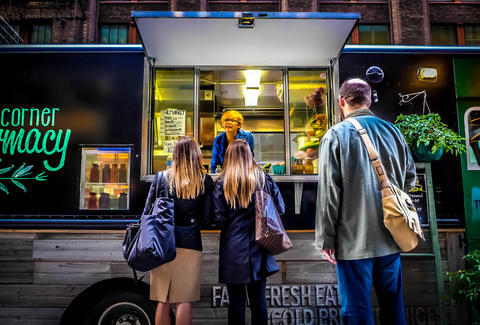 To help, we've outlined 60+ of the top Chicago food trucks you're likely to see around town this season, what you're getting food-wise from each, and where you'll most likely be able to hunt it down. It would seem vehicles transporting tasty little pies filled with bacon, dates, and goat cheese or beef that's been slow-braised in a malbec -wine reduction are on everyone's radar. This truck's freshly baked, Argentine empanadas sell out fast, so you'll want to keep close tabs on its location (hint: popular hangouts include Lake/Stetson, Adams/Wacker, Clark/Monroe, and Daley Plaza, but it's been known to roam well beyond The Loop). 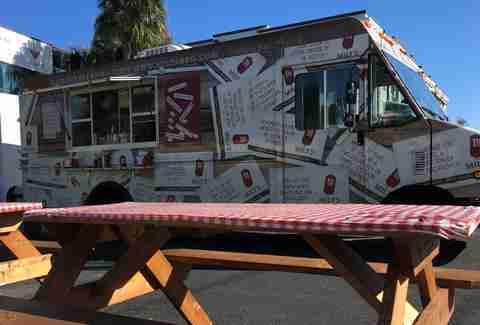 But you can always get your sweet and savory fix at any of the truck's stationary offshoots. Early mornings are rough, and even rougher if you're a student experiencing university life the "right" way. This tiny breakfast taco purveyor is the answer to every Northwestern student with a hangover's prayers as it zips around Evanston just before your dreaded 8am communications class starts. 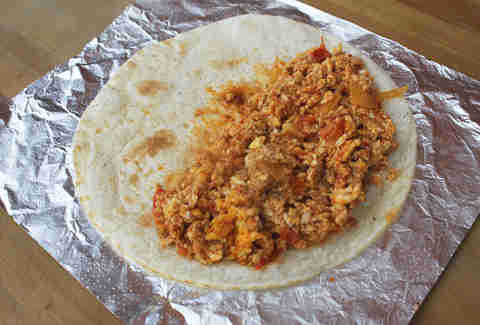 Grab a chorizo and egg, potato and egg, or machacado (egg, shredded dried beef, tomatoes, and onions) taco at one of their common campus stops: Church/Maple, Garrett/Sheridan, Chicago/Sheridan, Noyes/Sheridan, or Foster/Sheridan. Crème brûlée cupcakes, pink vanilla macarons, and red velvet cake pops are among the stupendous treats this truck is serving up on the city's streets (they pair well with the hot cocoa, coffee, and tea too). 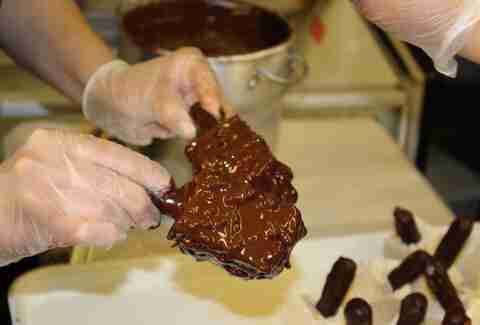 Find the handmade sweet stuff frequently at Michigan/Monroe and around the UIC campus. This family-run food truck serves up authentic Mexican favorites with a modern twist. 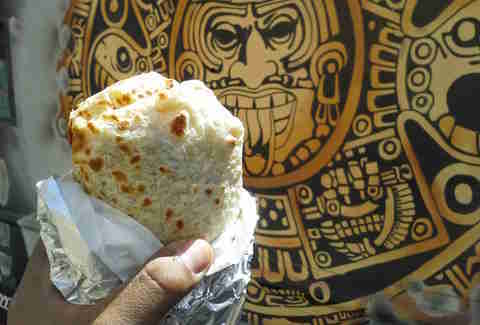 It often hangs out near the University of Chicago campus in Hyde Park, as well as outside the North Bridge shops and Adams/Wacker to deliver steak, chicken, and al pastor tacos, tortas, and burritos to The Loop masses. In addition to satisfying fluffy pancakes, this 24/7 breakfast truck takes morning classics to another level with two-bite chicken and waffles with candied bacon, sausage biscuits & gravy bites, and burgers sandwiched between cheddar-rosemary tater tot waffle buns... what??! You'll usually find it at the University of Chicago, some regular downtown truck stops like Daley Plaza, plus festivals and farmers markets all summer long. S'mores fixings, strawberry sauce, cinnamon sugar, and Pop Rocks -- these are just some of the ingredients that make your donuts what you never before imagined they could be. Now a dream team of three trucks, the coffee and mini buttermilk donut (and donut milkshake) fleet dashes around The Loop, favoring Jackson/Wabash, Adams/Wacker, and Addison/Southport, for breakfast and afternoon pick-me-ups hot off the conveyor belt. If hitting up the closest corner Starbucks sounds boring (because it is), how about grabbing a "meticulously selected, pristinely roasted" latte or iced coffee from a truck that's never in the same place? 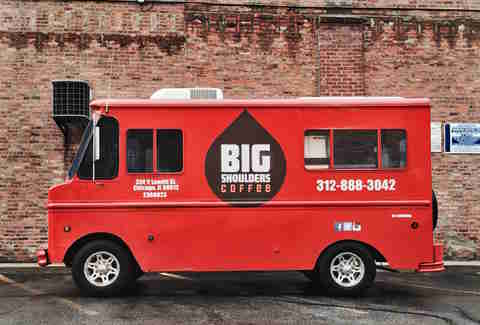 This truck might not have a single location, but it does have a rotating selection of single-origin coffees daily. Catch 'em outside 600 West Chicago, California blue line stop, Adams/Wacker, Michigan/Monroe, or elsewhere for a cup o' joe. 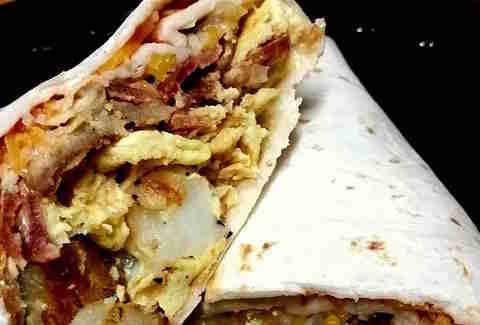 This truck's menu changes daily, but popular breakfast items like the Big Bacon Burrito with your choice of meat, breakfast potatoes, cheddar jack cheese, and salsa in a tortilla and lunch digs like the Firecracker Chicken, a tender roasted chicken thigh with sweet chili sauce and Sriracha slaw, keep patrons coming back for more. You'll find it frequently stationed at Addison/Southport, Adams/Wacker, Erie/Orleans, and Daley Plaza. 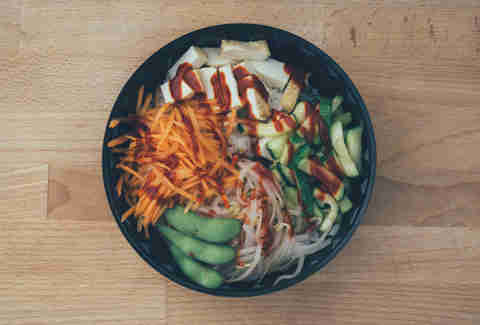 Grab signature dishes like spicy pork tacos and rice bowls at this Korean-Mexican fusion truck, which regularly visits the University of Chicago, Adams/Wacker, and Clark/Monroe. 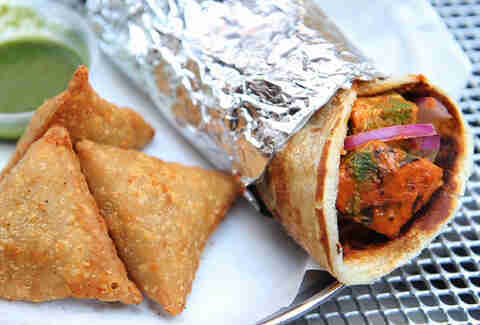 Whether you're into the chicken tikka (chicken breast marinated in tandoori masala and grilled to perfection) or the cheese paneer wrap served with tikka masala, cilantro mint chutney, and pickled onions, both are best paired with savory samosas, and you can find all of 'em at this Indian food truck, which chills at 600 West Chicago and the NBC Tower. 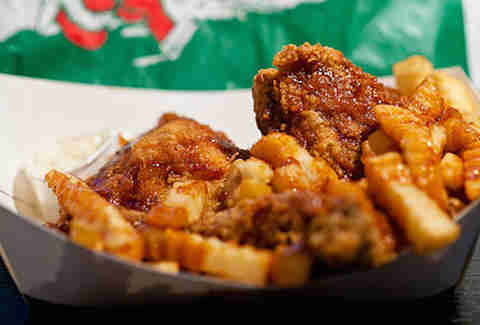 You don't have to actually visit the Big Easy for house-made Cajun and Creole eats. Fried shrimp (or pork belly) po-boys, muffulettas, shrimp & grits, seafood gumbo, and hush puppies with bacon jam are this truck's... jam. And you can find it just around the corner at the Aon Center or Michigan/Monroe. 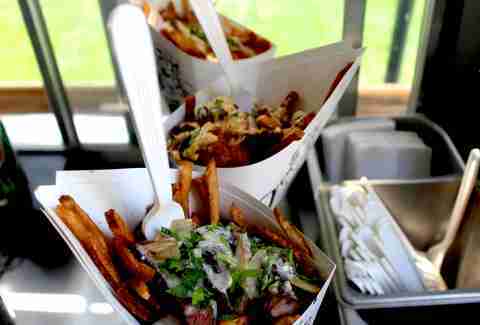 Get your frites fix made to order in a cone at this classic Belgian street food truck. After a night out, these hand-cut frites -- cooked in beef and duck fat until crisp, then salted to perfection -- and the rotating menu of savory toppings like braised oxtail, cheddar curds, and gravy will satisfy your late-night cravings, which is probably why regular hang-out spots include the Goose Island taproom and Fischman Liquors. This truck boasts a variety of meaty po-boys (choose from king crab, lobster, jumbo shrimp or chicken), a signature gumbo with spicy sausages and six kinds of fresh seafood (lobster, shrimp, crab, crawfish, salmon, and tilapia), lobster mac & cheese, and shrimp 'n' grits -- all with a Cajun kick. Catch it frequently at Halsted/Roosevelt, 600 West Chicago, and University of Chicago. 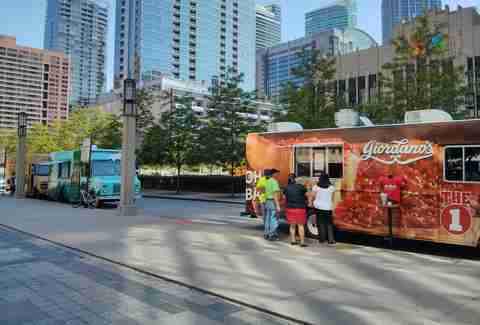 Grab Italian comfort food like arancini and panzerotti, plus miniature Chicago-style deep dish pizza and pepperoni calzones, to go from the curb at Adams/Wacker, 600 West Chicago, or University of Chicago. Just don't forget to pick up some cannolis or tiramisu for post-mozzarella gorging because passing up espresso-soaked ladyfingers layered with Mascarpone cheese or sweet ricotta-filled shells is actually a crime. Tasty grilled cheese sandwiches like "The Tenderizer" with layers of cheddar and mozzarella, bacon, fried chicken tenders, and both hot sauce and BBQ sauce (plus ranch for dipping) on buttery, thick Texas toast should be on your agenda, because this is America! 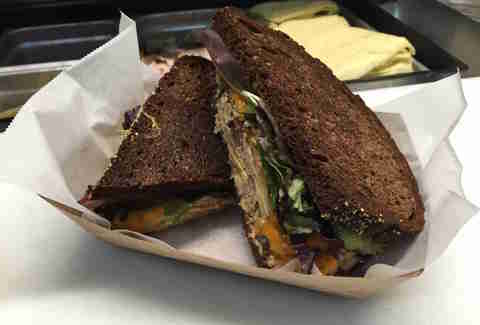 Find unrivaled grilled cheeses at Adams/Wacker, Clark/Monroe, Daley Plaza, and University of Chicago. 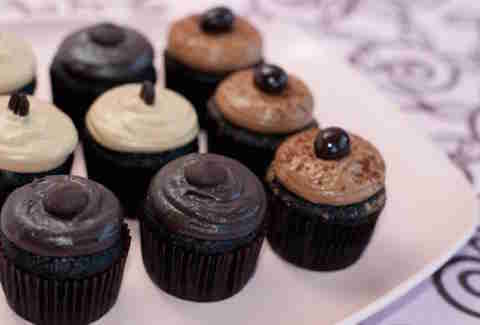 The red truck frequently hits up Lake/LaSalle, Jackson/Wabash, and Clark/Monroe among other spots in The Loop to peddle assorted mini and regular-sized cupcakes like "What's Up Peanut Butter Cup," cookies & cream, crème brûlée, and birthday cake (even if it's not actually your birthday). 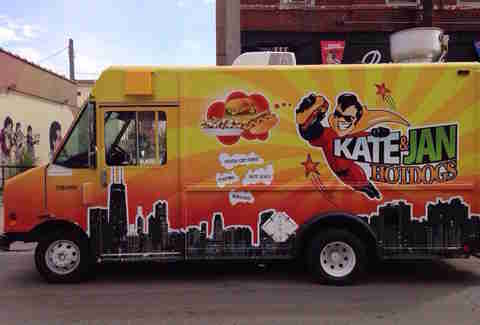 Don't be deceived by the name; this truck, which you'll often find it lurking around University of Chicago, 600 West Chicago, Daley Plaza, and Adams/Clark, isn't serving up your average lunchbox fare. 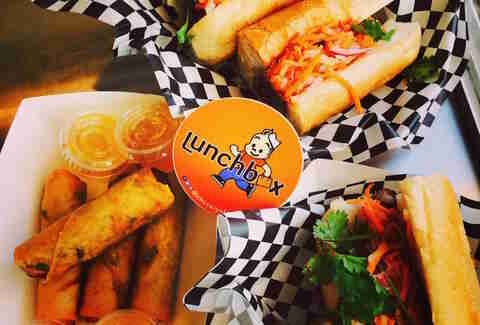 Here you'll get Vietnamese-style food with a twist: think Beefy Korean (their bestselling grilled beef simmered in a sweet Korean marinade) or Sloppy Thai (a family recipe of freshly ground chicken, basil, and bell peppers) in a banh mi sandwich, taco, or ricebox. And if they do have any fried pork spring rolls or fire rangoon (imagine a jalapeño popper in a fried wonton) left, better unload the truck. This monster-sized truck (seriously, it's 24,000lbs) rolls around with a legit built-in brick oven for cooking up freshly fired Neapolitan-style pizzas and other Italian cuisine with supreme ingredients. 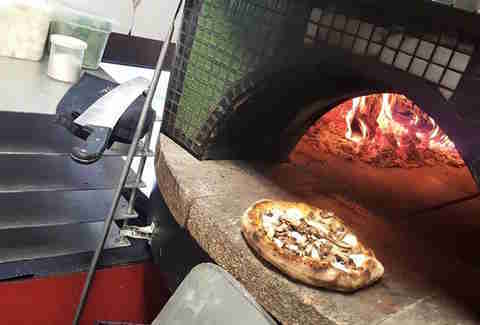 Make it a priority to track The Boss (often posted at Adams/Wacker and Daley Plaza) for a made-to-order thin crust pizza like the Pesto SCO with crushed double-fennel sausage, flour-fried onions, and basil pesto atop a white base. What else can you expect from a truck called "Chicago's Finest" other than city classics like Italian beef, Polish sausages, and hot dogs from Ream's Meat Market (no Vienna Beef dogs or red hots here), and even breaded steak sandwiches with fresh-cut fries? 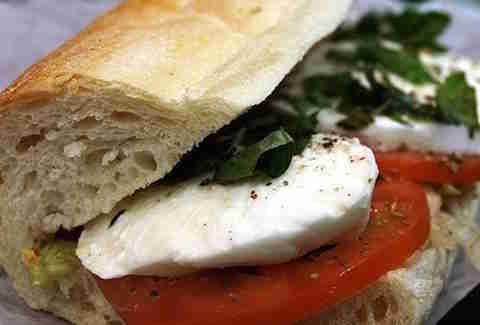 Devour traditional Windy City fare at a reasonable price from regular stops like Clark/Monroe and the NBC Tower. Inspired by the week's harvest, the city's only cold-pressed juice truck uses locally sourced ingredients for its juice and sandwich creations, including "The Goat," an egg sandwich with bacon, goat cheese, arugula, and peach rosemary preserves. Find farm-fresh eats on the street at Clark/Monroe, 600 West Chicago, Adams/Wacker, and University of Chicago. Scientists have discovered that happiness is located within a sweet and messy mash-up of dark chocolate, salty pretzels, and handcrafted vanilla (or cappuccino) ice cream... sprinkled with sea salt and fused to a crunchy chocolate and caramel dipped pretzel stick. We concur. Seek summer bliss at Michigan/Monroe and Daley Plaza. 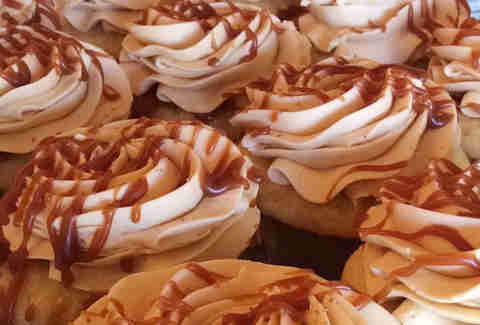 Schlepping all the way out to the Elmhurst-based bakery might be a hard sell for city slickers, even for delicious, salted caramel cupcakes. Fortunately, their well-fueled "Green Machine" makes our commute (and ability to get a sugar high) easier by making several Downtown stops (Franklin/Randolph, Jackson/Wabash, and Adams/LaSalle, to name a few). Plus, some of the proceeds go to cancer-fighting organizations, which means you can get the spicy Sriracha turtle AND the chocolate peanut buttercup, right? 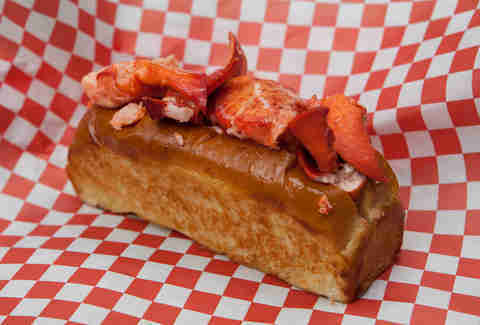 Chicago's first lobster roll eatery has three locations, but their truck takes the concept on the road with lobster, crab, and shrimp rolls, plus lobster mac & cheese and New England clam chowda. Regular hangouts include Jackson/Wabash, Clark/Monroe, Adams/Wacker, Aon Center, and Daley Plaza. How do you feel about pizza for breakfast? Because there's a truck for that. Find it at Adams/Wacker, the NBC Tower, or University of Chicago for a morning slice topped with eggs and sausage or bacon, or grab one covered in prosciutto, arugula, and shaved Parm for lunch. 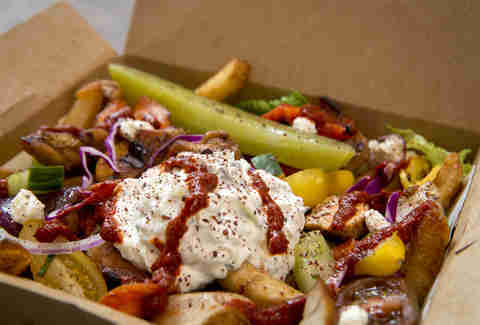 This traditional Turkish and German street food truck serves up juicy döner kebabs, currywurst, poutine, and salads (as well as vegetarian versions of everything) in a box or pita with house-made tzatziki yogurt sauce, harissa spicy chili paste, and sweet & tangy curry sauces. Find them at Clark/Monroe, Daley Plaza, 600 West Chicago, University of Chicago, and even on the Far North Side for dinner. 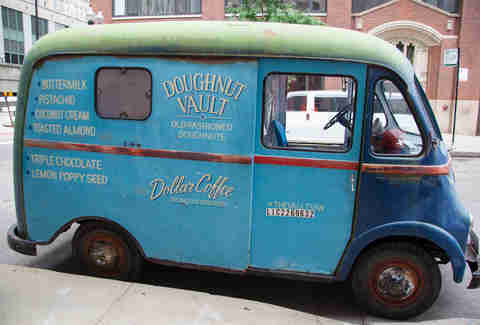 The retro Vault Van hits the streets seven days a week carrying old-fashioned donuts with flavors like buttermilk, pistachio, triple chocolate, coconut cream, toasted almond, lemon-poppy seed, and a rotating daily special. 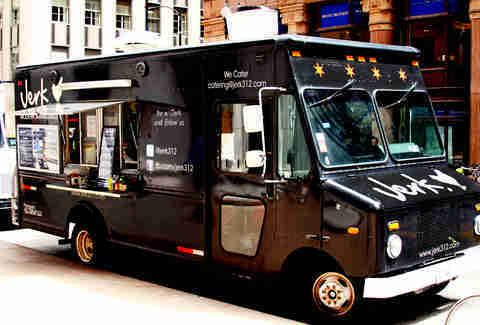 They're regularly at Jackson/Wabash, Clark/Monroe, State/Lake, and Adams/LaSalle on weekdays, and Addison/Southport and Oz Park on weekends, but consulting their Twitter feed using #VaultVan for the current locations would be wise... as would getting there as soon as possible before they sell out. Forget your boring oatmeal. This truck concocts hearty, egg-focused sandwiches for breakfast AND lunch, including one of the 40 Chicago sandwiches to eat before you die. 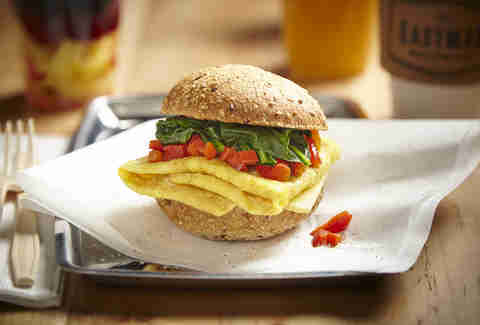 The Fairfax comes loaded with Egmont cheese, sautéed bell peppers, wilted spinach, and house green goddess sauce on a seven-grain roll. This rig usually sets up shop around Jackson/Wabash, Monroe/Wacker, Addison/Southport, Adams/LaSalle, and Monroe/Sangamon. 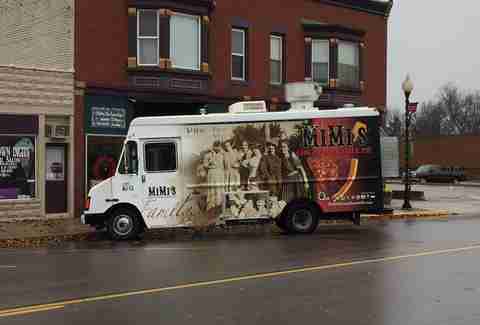 The dynamic husband-and-wife duo behind The Fat Shallot truck just launched a second meals on wheels concept, which aims to bring quality deli sandwiches to city streets. Stand-outs include classics like the Reuben (house-brined corned beef, melted Swiss cheese, garlic slaw, and Fat Pickle sauce on marble rye) alongside fries topped with Fat Pickle sauce and crispy pastrami. Be sure to check social media or the website schedule for their whereabouts (often Adams/Wacker, Aon Center, and 600 West Chicago) and current menu. This bold red truck doles out seasonal BLTs piled high with smoky bacon, arugula, tomato, avocado, and truffle aioli on Texas toast as well as grilled cheeses with melted muenster, sautéed spinach, and caramelized onions on sourdough. A side of fries topped with spicy sesame aioli and black sesame seeds will make your week. Stalk the truck on social media or check the website schedule for the latest menu and location (hangouts include Adams/Wacker, Aon Center, and University of Chicago). Fresh coffee and delicious, small-batch donuts make the world go 'round. 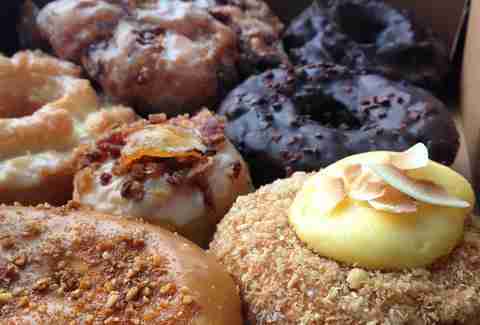 You can never have too many donuts, so it's a good thing they're loaded with buttermilk, classic jelly, butterscotch praline, coconut cream, maple-glazed pineapple and bacon, and ICE CREAM DONUT SANDWICHES while patrolling Clark/Monroe, Adams/Wacker, Adams/LaSalle, and Addison/Southport. It's classical conditioning: just like when you heard the ice cream truck pulling into the neighborhood as a kid, you'll want to sprint for your money when you spot this rolling bakery known as "Big Blue" getting close on Twitter. It's hard not to cave when fresh-baked Nutella and cookie dough cupcakes, among other varieties and weekly specials, are on board. 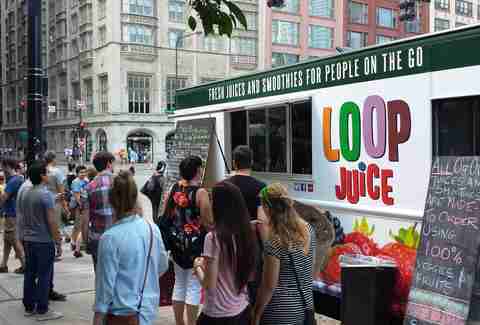 You'll often find it near the Aon Center or Daley Plaza, but track the dessert van on Twitter or consult the website schedule to be sure. 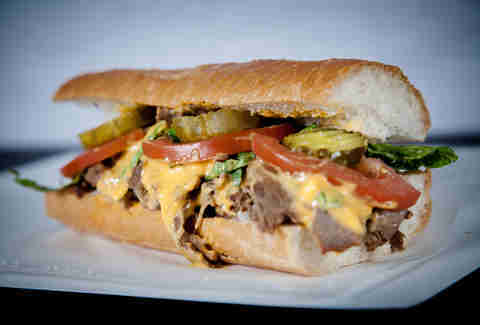 The Philly cheesesteak truck with a Bridgeport-based restaurant has a variety of sandwiches like "The Fatty" (steak, onions, peppers, melted cheddar, crispy fries on top, truck-made bbq sauce, and smoke-it sauce) and sides like fries topped with chicken or steak and melted cheddar to make it extra fatty. Popular hangouts include Adams/Wacker, Clark/Monroe, and Addison/Southport, among others. It's no surprise the deep dish pizza heavyweight would have an official #GioFoodTruck to spread awareness about its cheesy goodness. 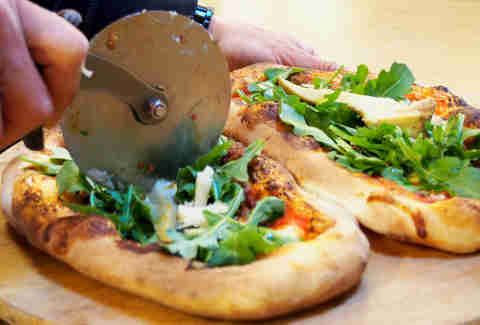 We can't guarantee the wait will be shorter than its brick-and-mortars, but you can get your own personal-sized pizza usually around Franklin/Randolph, Jackson/Wabash, or Adams/Wacker. Uninspiring lunches be damned. 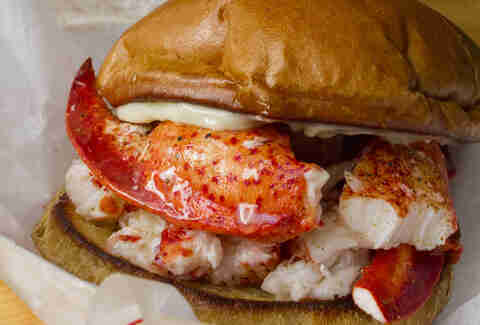 Mix up those lame workweek meals at your desk with something more substantial like a Happy Lobster Roll with 4oz of fresh Maine lobster, butter drizzle, seasoning, and a touch of mayo (or, conversely, an Angry Lobster Roll with spicy mayo and hot giardiniera) on a soft, burger-style bun. The fried lobster mac and cheese bites with spicy dipping sauce from this truck, which frequently stops at Adams/Wacker, Clark/Monroe, 600 West Chicago, and the Aon Center, will also do the trick. 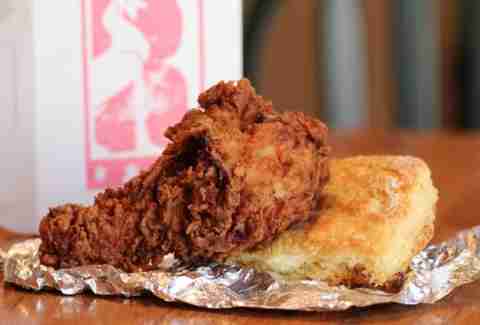 Fingerlicking good fried chicken and catfish from this South Side staple can be found roaming the streets at University of Chicago and Downtown around Adams/Clark, Adams/Wacker, and Daley Plaza. 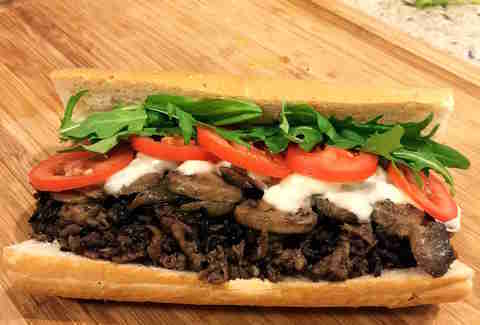 Haute food truck eats like Buffalo chicken, duck fat sautéed mushroom and Swiss, or "Nick The Beef" (shaved ribeye steak, gyro meat, white American cheese, tzatziki sauce, tomatoes, cucumbers, and onions) sandwiches are curbside at 600 West Chicago and University of Chicago. 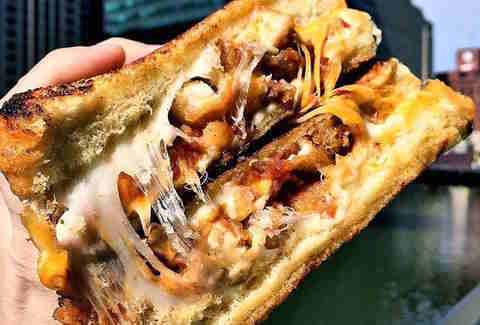 This gourmet sandwich truck dishes up must-try corned beef grilled cheeses with Guinness caramelized onions, white cheddar, and whole grain mustard on marble rye and a Buffalo chicken sandwich with fire sauce, blue cheese, slaw, and an onion ring garnish. 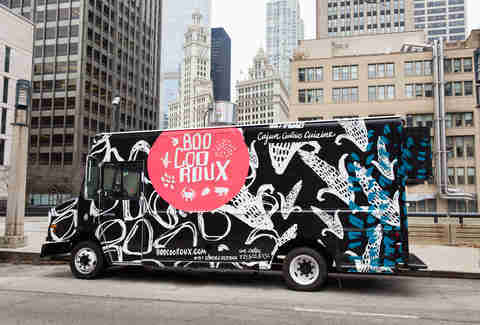 Keep your eyes peeled for the truck at Clark/Monroe, Adams/Wacker, Daley Plaza, and University of Chicago. 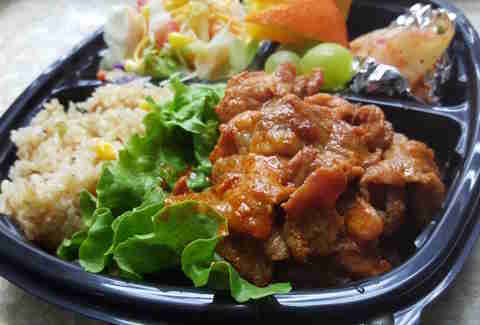 Hunt down Jamaican fare like tasty jerk beef and pork sliders, meat and veggie patties, jerk chicken salads, yuca fries, and house-prepared coconut macaroons at Jackson/Wabash, Adams/Lasalle, Clark/Jackson, and outside the Aon Center. 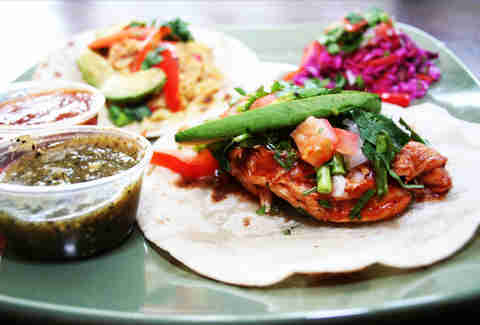 The roster of sauces include Rude Girl, Jerk BBQ, and a cilantro lime aioli for that extra kick. Fill your need for a jumbo hot dog with a Polish Mild, Italian Spicy, or German Oktoberfest, and team whichever solid choice you make with poutine to go. 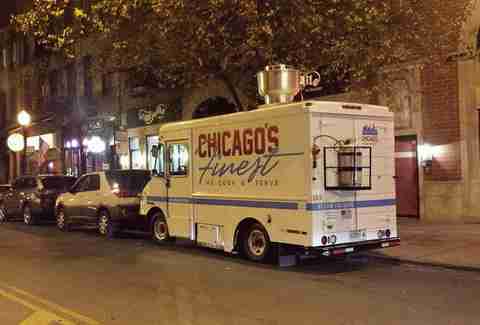 You'll often find this truck at Michigan/Monroe, Adams/Wacker, and University of Chicago. 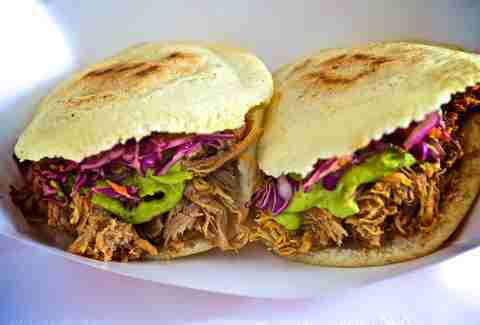 This food truck enterprise from New Orleans brings Latin American street fare straight to Chicagoans' bellies. The process is simple: choose your vessel (like tacos, arepas, or burrito bowls), then build out your feast by picking a protein like braised pork or black beans and queso fresco, and top it with a sauce like guasacaca (Venezuelan guacamole) or the "stupid hot" sauce. They're often at Clark/Monroe, Adams/Wacker, and Franklin/Randolph during the week, but be sure to check their calendar or social media. This taqueria on wheels serves up cheap, authentic burritos, tortas, and tacos (three flavorful, corn tortilla tacos topped with pork, steak, or chicken, onion, cilantro, and a lime wedge with rice and beans on the side for $7 is a steal). Find 'em at Adams/Wacker and Clark/Monroe. 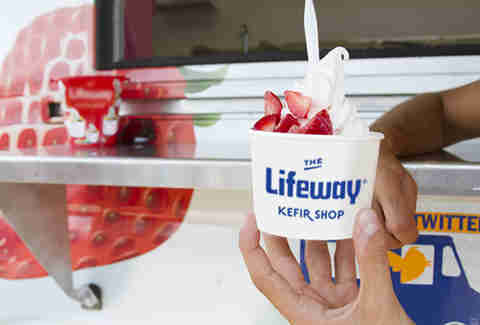 Yogurt's smooth, tart cousin, kefir, is packed with more than twice the probiotics of froyo. The cafe sends a couple of its daily flavors out on the road. The refreshing, dessert-y snack comes in satisfying flavors like raspberry, mango, pomegranate, pink lemonade, green tea, and salted caramel. Pile on the toppings at the truck, which sometimes stops at 600 West Chicago, Erie/Kingsbury, Michigan/Monroe, and outside Wrigley Field. 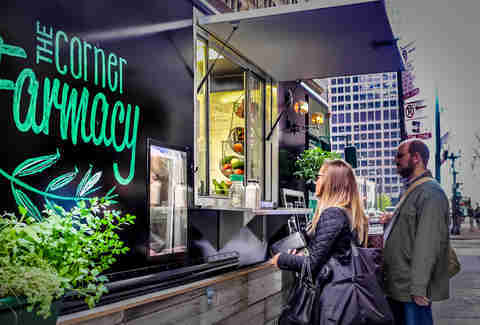 You don't have to hit up the Chicago French Market location to fuel your body with all-natural juice and fresh smoothies when this truck is running (usually at Clark/Monroe and Daley Plaza). Try the Green Smoothie, a blend of pineapple, orange, mango, spinach, kale, and parsley. 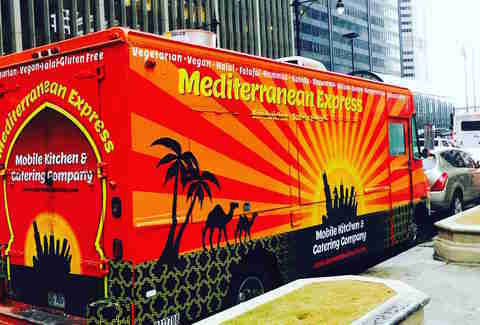 Vegans, vegetarians, and gluten-free gluttons can delight in the fresh and fast Mediterranean cuisine from this Lebanese halal truck. For your falafel and hummus fix, head to where it's often spotted at Adams/Wacker or University of Chicago. The Lakeview-based kosher barbecue joint has a truck-load of winning offerings like pulled chicken and brisket sandwiches, a seitan sandwich for vegetarians, and brisket baked beans and cornbread. Find your next meal at Jackson/Wabash, Adams/LaSalle, Monroe/Wacker, outside the Aon Center, and plenty of spots outside The Loop. The relatively new truck with Chicago-style deep dish pizza (think five-cheese pies) usually hangs out with the Daley Plaza and 600 West Chicago crowd. 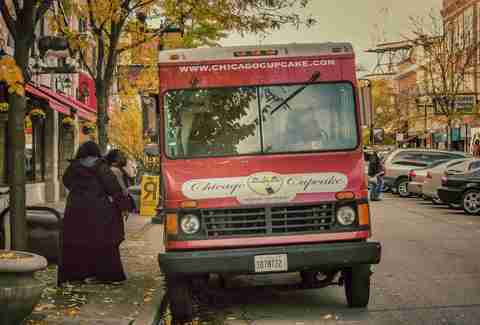 This truck dishing up traditional Mexican mainstays regularly rolls to Adams/LaSalle, Clark/Monroe, 600 West Chicago, and University of Chicago to shill out hot, home-cooked tortas, tacos, tamales, and enchiladas among other snacks for lunch. 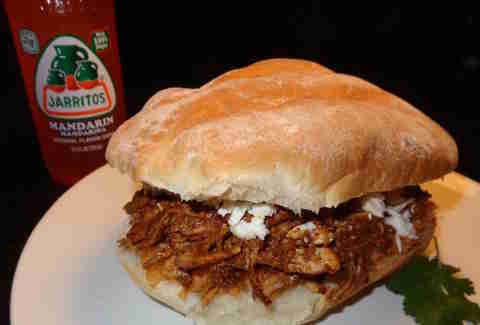 Stand-outs include ground steak and pork tortas with chorizo and beans or cactus and chickpea in mole sauce. 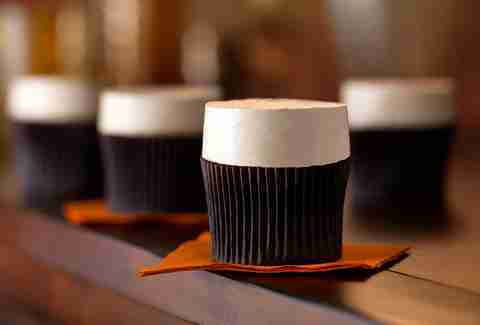 There are never too many cupcake trucks on the road, especially when one of them distributes boozy-flavored varieties like Grand Marnier, chocolate bourbon, and margarita among the batches of lemon meringue and bacon maple. 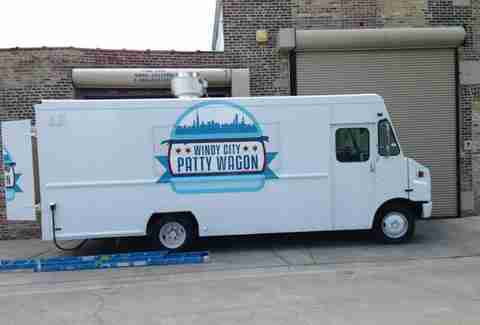 Find it parked outside 600 West Chicago, Adams/LaSalle, Clark/Monroe, and Jackson/Wabash. Eating a work lunch of cold cuts slapped between slices of wheat again? Naansense! This food truck offers modern, Indian-inspired eats like create-your-own rice bowls, salads, and naanwiches. 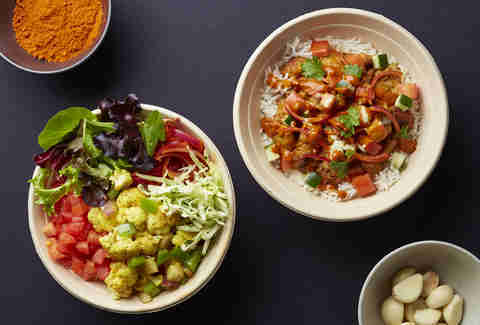 Choose your base, pick your protein (like slow-braised lamb, tandoori chicken, chickpeas, or roasted veggies in savory spices), your sauces (from mild cashew ginger korma to hot red chili vindaloo), then add toppings like cabbage slaw, cucumbers, cilantro, and a cool garlic or fire red dressing. 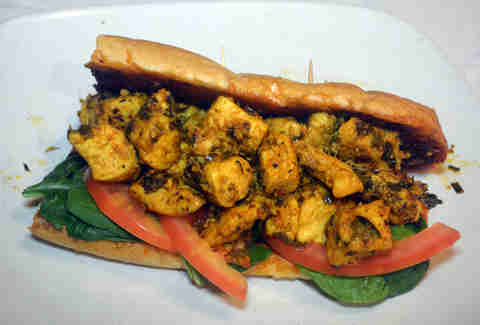 Find flavor at University of Chicago, 600 West Chicago, or Adams/Wacker. 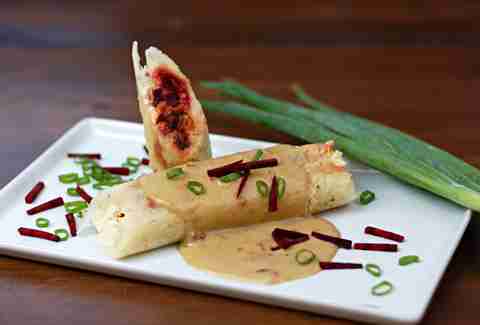 Do you love French crepes? 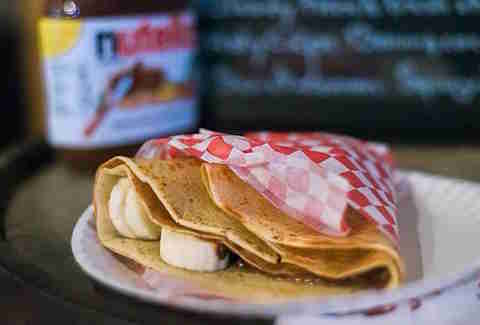 This Parisian truck's serves both sweet crepes like caramel pecan and the "Holy Crepe" with fresh banana, Nutella, and coconut as well as savory crêpes with ham and fresh-grated cheese. Choice parking spots include Clark/Monroe, Michigan/Monroe, and University of Chicago. Delicious pierogies and sausages abound at this Polish street food truck, which frequently stops at Clark/Monroe. Adams/LaSalle, Daley Plaza, and University of Chicago. 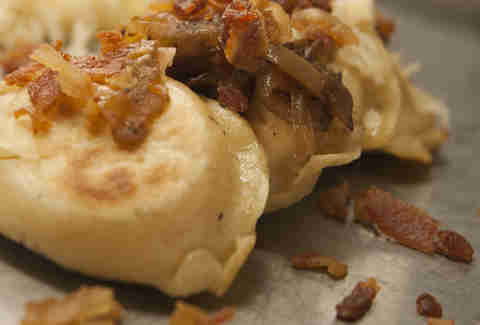 Try Polish dumplings with braised beef, cheddar and potato, spinach and feta, or sauerkraut and mushroom -- or all of 'em. We recommend topping them with bacon, caramelized onions, and sour cream. Baos, sliders, tacos, and bowls, oh my! You'll probably hit up this modern Asian street food truck more than once with its diverse vessels and fillings like lemongrass chicken, teriyaki tofu, and five-spice pork belly, not to mention the kimchi fried rice and mochi ice cream. Find it at 600 West Chicago, Adams/Wacker, the NBC Tower, and University of Chicago... and if you like it really spicy, let 'em know! 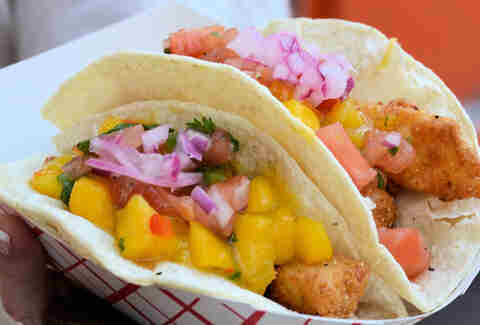 While it's affiliated with six brick-and-mortar locations in Chicago, the Southern-inspired food truck is free to roam. It's regularly part of the lunchtime action at Daley Plaza and Willis Tower, among other hotspots in the city. Find them in the truck line-ups for barbecue like pulled pork and chicken sandwiches, ribs, brisket, mac & cheese, and cornbread. 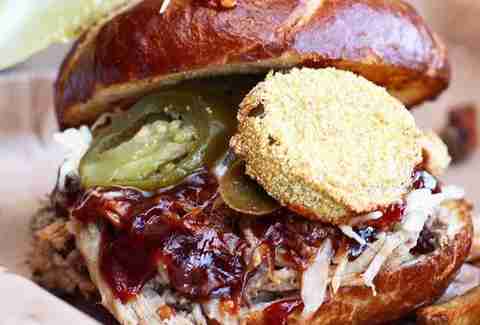 This Southern comfort food truck doesn't mess around. Get crispy, spicy fried chicken sandwiched between fluffy buttermilk biscuits with Carolina-inspired sides like creamy mac & cheese and peach cobbler downtown at 600 West Chicago, Clark/Monroe, and Adams/Wacker. 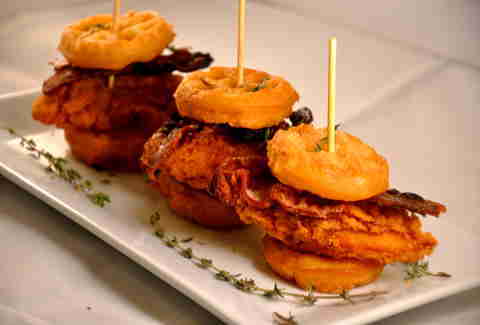 From Sriracha Buffalo chicken sliders to Angus cheddar burgers topped with brown sugar bacon and caramelized onions, Chicago's original slider truck slings some mean, mini sandwiches. 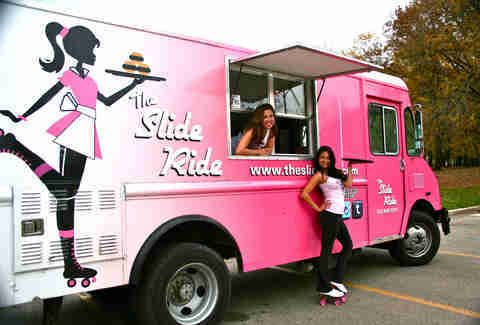 Find the "Pink Lady" and its rotating roster of sliders and sides frequently at Clark/Monroe, Adams/Wacker, or Daley Plaza. 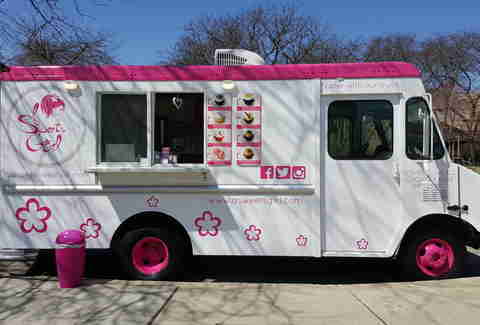 This pink truck emblazoned with flames serves a rotating daily assortment of gourmet sweets like moist red velvet cupcakes, old-fashioned banana puddings, chocolate mousses, fluffy whoopie pies, and decadent cake pops. 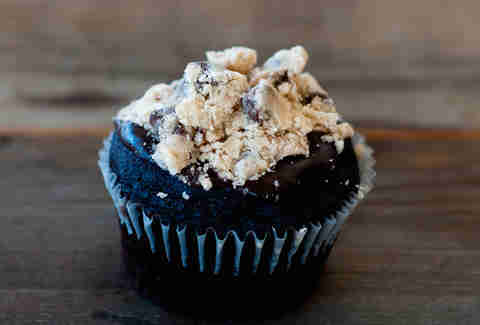 Find the homemade treats commonly at Michigan/Ohio, Franklin/Orleans, Fairbanks/Superior, or Clark/Monroe. The luchador-masked guys at this truck offer up Baja fish and Yucatecan-style roasted pork tacos with handmade tortillas, Barbacoa-style roasted chicken tamales with Michoacán green peanut mole, and sides like guacamole, queso fundido, and elote (grilled corn with chipotle mayo and fresco cheese). 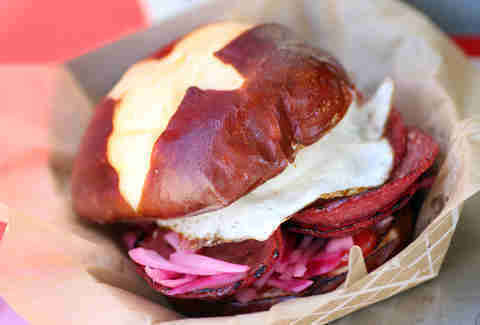 Catch them at regular stops during the week: University of Chicago, 600 West Chicago, Clark/Monroe, and Adams/Wacker. 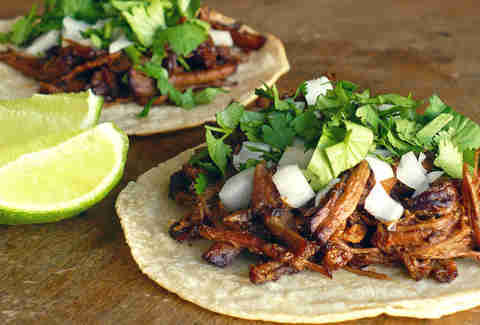 Specializing in tacos with a Latin American twist, this truck features popular combos and taco options like carnitas with pulled pork in a zesty house-made BBQ sauce and savory carne molida beef tacos with plantains along with a fusion tortilla and plantain chip mix to pair with house guacamole and salsas. It's usually stationed around Clark/Monroe, Adams/Wacker, and University of Chicago. From stuffed burgers to turkey quinoa, falafel, and veggie patties, this is your go-to truck for anything in patty form. Handmade gourmet burgers prepared with local ingredients like a seasoned beef patty stuffed with chihuahua cheese and jalapeños, and topped with roasted poblano peppers and green chile aioli alongside hand-cut pair well with the rosemary fries. Regular haunts include University of Chicago, NBC Tower, Daley Plaza, and 600 West Chicago. 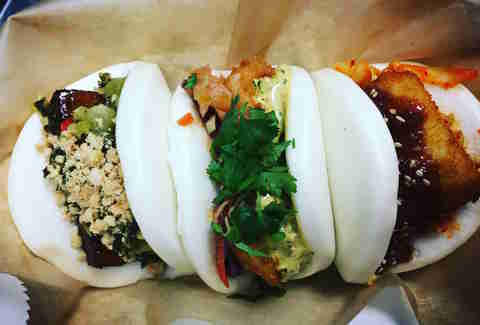 Your day's about to get steamier with the BAO-Mobile, which peddles portable, Asian-inspired snacks. Savory options like pan-seared potstickers, steamed dumplings, baos, and rice buns come with various fillings like pork and cabbage, BBQ pork, Thai curry chicken, spicy Mongolian beef, and glazed pork belly. 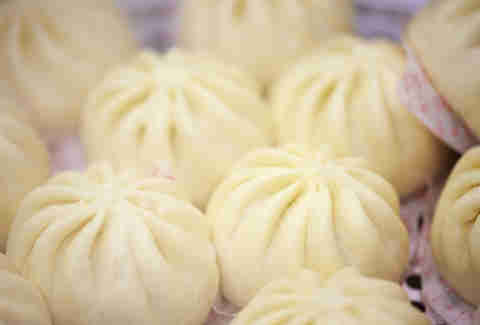 Even breakfast is covered with the spicy Sichuan sausage bao. Find it frequently at Adams/Wacker and University of Chicago. 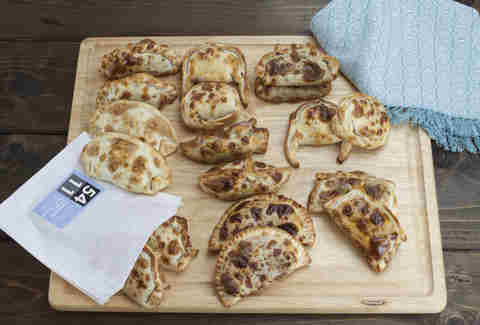 Signature dishes at this Asian fusion truck include handmade, steamed dumplings with a blend of pork and Chinese chives, baowiches with pork belly that's been slow braised with Taiwanese spices, and other mad creations like "Kimcheesy Rice Balls" and a "Sriracha Pecan Fudge Brownie." Frequent weekday spots are Adams/Clark, Adams/Wacker, Daley Plaza, and University of Chicago. Nicole Bruce is a contributing writer for Thrillist. She's going to go hunt down some pork belly baos now. Find her on Twitter at @nicoleabruce.